This villa is love at first sight! Created by a well-known Italian interior designer with international reputation for its “Country Living Style”. 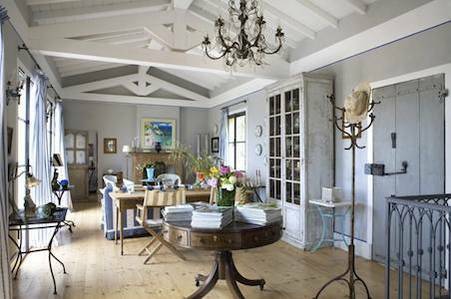 She built this solid house a few years ago, creating open spaces and bright rooms and gave it a very special charm with old doors and tiles and many other antique details. The harmonie of colours, lovely details and antique furniture makes the interior a jewel. Situated in the middle of terraces with olive trees, this country house in antique pink and mint green is surrounded by a property of approx. 2,000 sqm, which has been designed as a park with a composition of Mediterranean plants: Agaves, olives, cypress and lemon trees, herbs, roses, hydrangeas and many other flowers bloom in different seasons. Several outdoor areas with gravel or antique tiles invite to relax. A pool of approx. 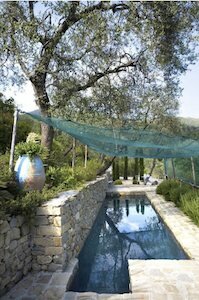 4 x 8,5 m was designed to fit perfectly on a terrace between the olive groves. Enrica has been searching a long time for the right place for this villa: Pantasina - a very peaceful village in the hinterland of Imperia. The country house is situated right next to this old and still very original village and enjoys a splendid view over the olive groves - evergreen all year round. However, this peaceful place is less than 20 minutes away from the coast and its turbulent beach life. The villa of approx. 230 sqm net is currently divided into two apartments, one of them rented out successfully as a holiday home. The upper apartment is L-shaped and encloses a very spacious terrace. This level offers a large living and dining area with open fire-place and adjoining kitchen. On the same floor there are two bedrooms, one with a big and the other with a small adjacent bathroom. The lower floor also offers a large living and dining area with integrated kitchen. On its left and its right there are two bedrooms, both with an adjoining bathroom. For more information, please mail or call us!